At 6-foot-4 and 5-foot-8, respectively, one wouldn’t think that Ben and Devin Spencer of the Massachusetts men’s lacrosse team are related at first glance. Make no mistake, though–the two are in fact brothers. And lacrosse is the driving bond that has kept them together. For as early as they can remember, they’ve had lacrosse sticks in their hands. The sport is in their blood – “there’s baby pictures of us with lacrosse sticks,” said Ben. Their father, Ted Spencer, played lacrosse for the Minutemen from 1983-1985 and later became an assistant with Brown and Yale before being named head coach at Fairfield. Ted Spencer also directs “Blue Chip 225,” a recruiting showcase he founded in 1998 designed to link prospective college lacrosse players with Division I coaches. With Ben, a senior, set to graduate after this 2019 season, this will most likely be the brothers’ last year playing organized lacrosse together, and they’re savoring what’s left of their final go-around. From being on his own as a freshman, Ben believes that he was able to make the transition from high school to college lacrosse easier for Devin. The summer before Devin’s freshman year, they trained together, with Devin peppering Ben with questions about what to expect. Having played together for so long, Ben and Devin would say that their chemistry on the field together is at a different level from the rest of their teammates. “We know each other’s tendencies, we know when to pick each other up,” said Devin. When they were very young, playing in the Bobblehead division, they played on the same team, but then separated for a few years. Once they started playing at the club and high school levels, however, they resumed playing together, and—obviously—have continued to do so at the collegiate level. Ben and Devin believe that their different playing styles complement each other well. Whereas Ben’s game is more based on power and downhill speed and athleticism, Devin’s is more based on quickness and stick skills. “It’s always good to have the best of both worlds,” said Ben. After graduating, Ben intends to take a gap year and wait for Devin to play out his senior season. Then, the two will accept graduate assistant positions at Western New England, where they will pursue master’s degrees in athletic administration while assistant coaching the lacrosse team. “I’ve always wanted to try the coaching thing, so this will be a really cool opportunity, and plus I get to do it with [Devin] which, you know, just extends the lacrosse experience,” said Ben, who hasn’t entirely ruled out playing professional lacrosse. “It’ll be cool to try the coaching route, because our dad’s coached for so long, and I think it’ll be a good experience,” said Devin. Currently on a six-game tear and No. 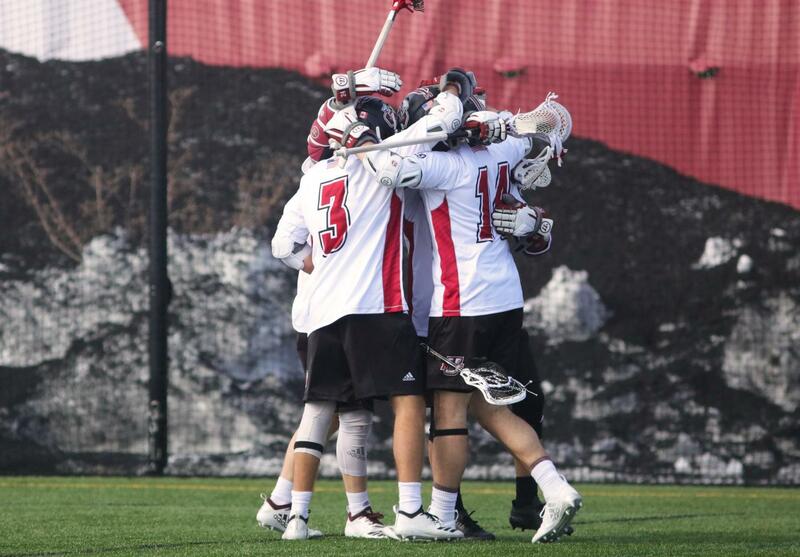 17 in the country per Inside Lacrosse’s rankings, UMass has four more conference matchups left on its schedule before the CAA championship tournament. The Spencer brothers hope the team can go “to the top, but we got to focus on one game at a time, and we’re focused on Hofstra. Day-to-day basis,” said Ben. There’s still plenty of lacrosse to be played, and the Spencer brothers are worried about the short-term, not the long-term.